Acne is a skin condition that affects up to 80% of people in their teens and twenties, and up to 5% of older adults. While many people recover from acne without any permanent effects, some people are left with deep scars and depressions, which can be psychologically and emotionally damaging. Treating acne scarring can lead to improved appearance, better self esteem, and promotion of skin health. Multiple treatment options are available to improve acne scarring. The treatment plan is dependent on several factors, including the type of acne scars that you have and whether they are primarily on the surface or extend into the deeper layers of the skin. It is also important to assess each patient’s skin type to determine any risks or potential complications. During the initial consultation, our physician assistant and acne scarring specialist, Holly Rafferty, will discuss all of the possible treatment options and recommend a personalized treatment plan to optimize the eventual outcome. 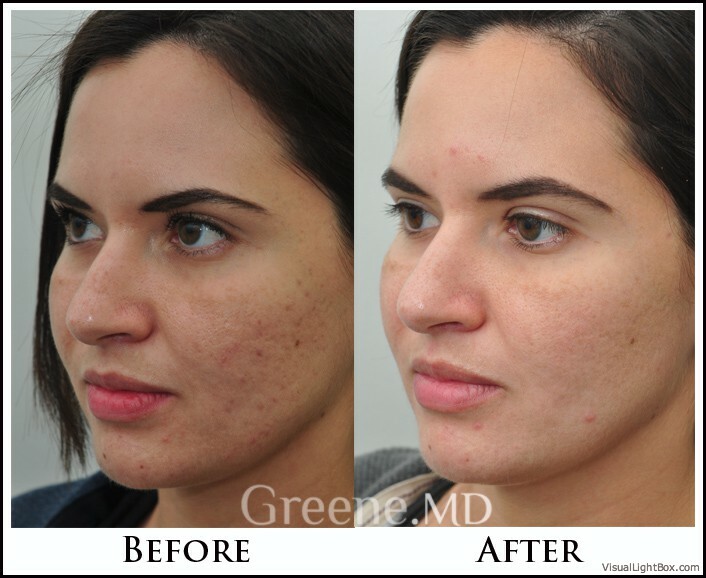 Dr. Greene directs a Laser Center of Excellence that delivers the most cutting-edge laser treatments available. 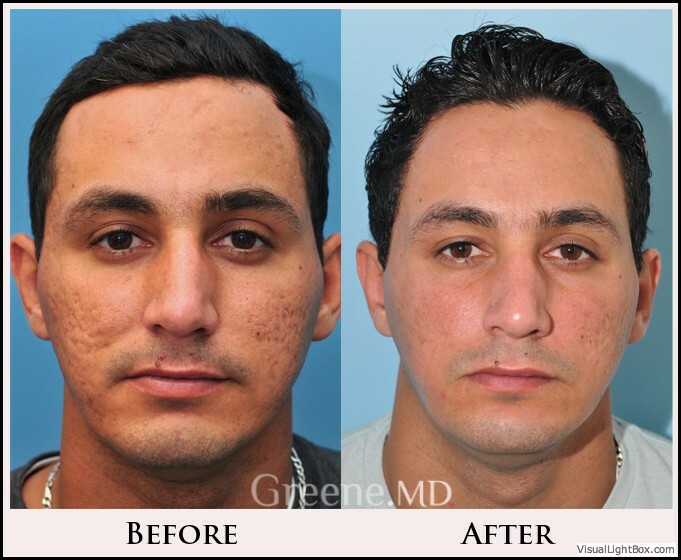 As a leading expert in laser and light technology, Dr. Greene offers the highest level of care with his aesthetic laser treatments. 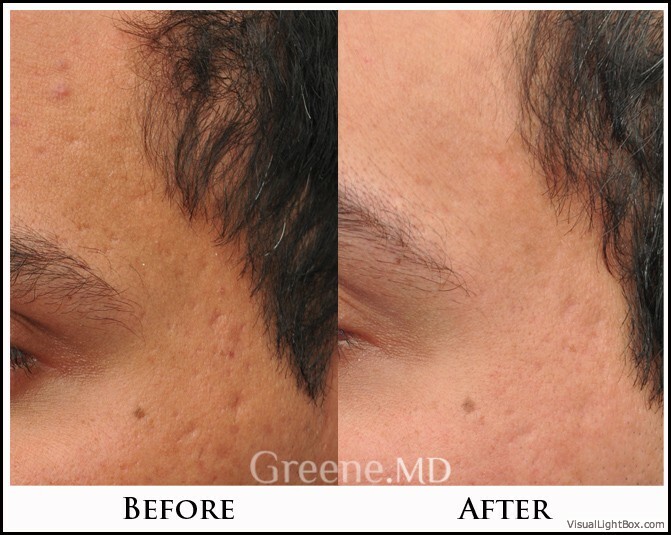 After careful evaluation, Dr. Greene has selected the safest and most effective laser treatments for his laser center. While many ‘laser clinics’ and ‘medspas’ offer a number of laser treatments, experience and a physician’s supervision are often lacking. A patient should not underestimate the importance of being treated at a physician’s office when it comes to their laser treatments. Lasers and light-based devices can lead to serious complications if not used properly. 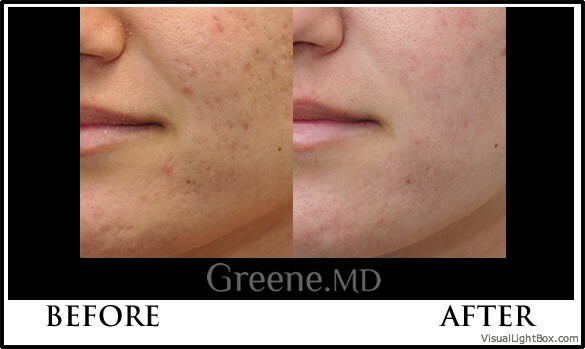 At GreeneMD, all Acne Scar Treatments are performed by our Certified Physician Assistant, Holly Shipley. WHAT IS THE DIFFERENCE BETWEEN CO2 ABLATIVE LASER AND NON-ABLATIVE LASER RESURFACING? There are two types of laser resurfacing treatments used for laser skin treatments, ablative and non-ablative. Ablative lasers vaporize the outer layers of the skin compared to non-ablative lasers that heat up the targeted tissue collagen while sparing the outer skin. It is important to note that ablative lasers require more recovery time and have increased potential risks. The downtime for our CO2 Ablative (Total FX) is approximately 1-2 weeks, whereas the redness and swelling from our 1540 Non-Ablative laser is usually less than 24 hours. 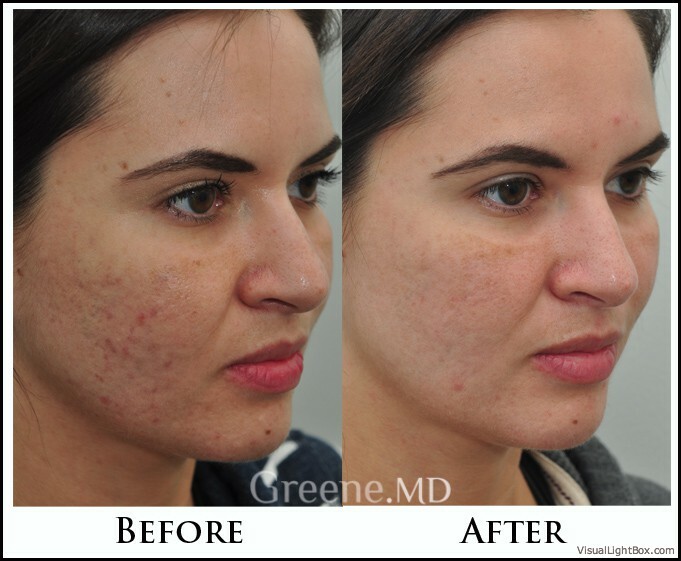 Both lasers may require multiple treatments depending on the severity of acne scarring. WHAT CAN I EXPECT DURING THE ICON 1540 NON-ABLATIVE LASER RESURFACING TREATMENT? The skin is first cleansed to prepare it for treatment. During treatment, the laser handpiece is applied directly to the skin. The handpiece uses a strong built-in cooling technology to protect the outer skin and minimize any discomfort. During the first 24 hours after treatment, patients typically experience mild redness and swelling. Since the treatments are non-ablative and the skin surface is left intact, there is no oozing from the skin. Most patients return to work and other normal daily activities the following day. Multiple treatments are required for acne scarring. We usually recommend 3-4 CO2 Total FX (Ablative) Laser treatments and 4-6 ICON (Non-Ablative) Laser treatments; however, this is dependent on the severity of scarring. Deep scarring may require additional treatments, as the response to treatment varies among patients. 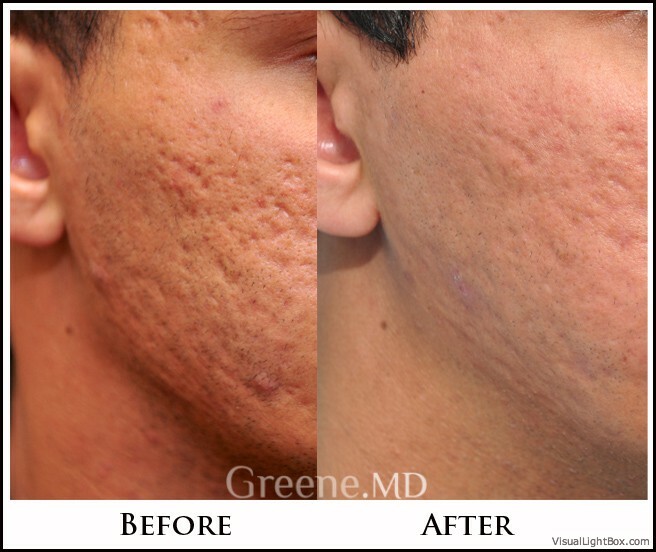 WHO IS A CANDIDATE FOR ACNE SCARRING TREATMENT? 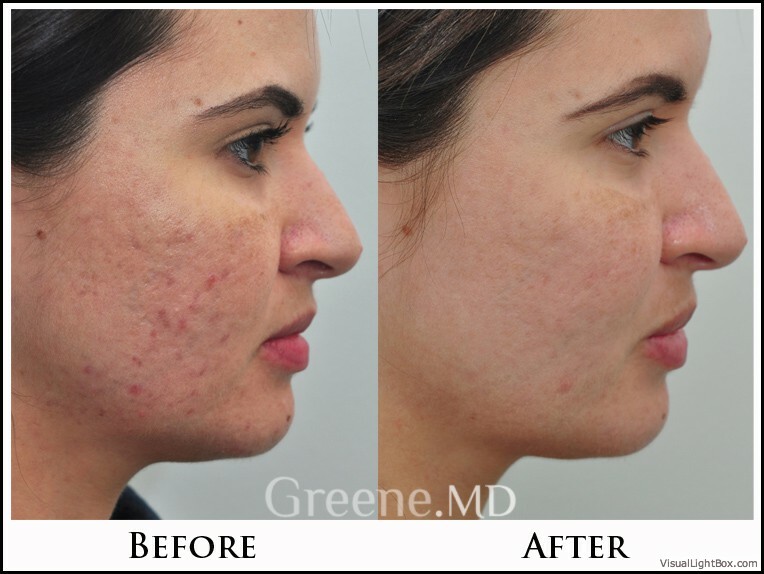 Patients with any degree of acne scarring are good candidates for fractional laser resurfacing, ablative or non-ablative. However, deeper “ice-pick” scarring may require surgical excision or other treatments. Patients who have taken Accutane in the past 12 months or have a history of keloid scarring should not undergo these laser treatments. WHAT CAN I EXPECT AFTER A TOTAL FX PROCEDURE? Most patients notice an improvement after the skin peels, but collagen growth and remodeling leads to additional improvement and refinement over a period of approximately three to six months. While some patients notice improvement after only one treatment, most patients will benefit from multiple treatments. WHAT ARE THE ADVANTAGES OF THE ULTRAPULSE LASER OVER OTHER RESURFACING LASERS? There are many advantages of the Lumenis Ultrapulse over other fractionated CO2 lasers. As a pulsed laser, the Ultrapulse is able to safely generate a much higher energy than other lasers, with no increase in complications or risk. The Ultrapulse is considered by many to be the ‘gold standard’ for fractionated laser resurfacing. The ability to deliver higher energies makes the Ultrapulse well suited to the treatment of acne scars, which tend to require higher energies to achieve an excellent clinical result. IS THERE DISCOMFORT DURING OR AFTER TREATMENT? To minimize discomfort, a topical anesthetic is used. Following the procedure, patients often experience a ‘sunburned’ feeling that subsides over two to three hours. After this, most patients report no discomfort. WHAT IS THE RECOVERY LIKE AFTER A TOTAL FX LASER RESURFACING PROCEDURE? Patients return home immediately following the procedure. The downtime is typically less than one week. The treated skin usually peels in five to six days. The skin may then be slightly pink, which typically fades within a week or two. This is easily concealed with makeup or tinted sunscreen. Dr. Greene recommends specific medical-grade products to accelerate the healing process, and our office provides patients with all instructions for post-procedure skin care. ARE THERE ANY RISKS OR COMPLICATIONS OF A TOTAL FX PROCEDURE? Compared to traditional CO2 laser treatments, there are very few risks and complications associated with fractionated CO2 treatments. Risks are minimized if sun exposure is limited for a short period after the procedure. Treatment with the Ultrapulse laser is very safe because the treatments are very precise. Any changes in skin pigmentation are usually mild and temporary.